Earlier this year BNY Mellon conducted an in-depth survey with 55 corporate clients across a variety of industries. The questions covered the impact of several new payment technologies for corporate treasurers. These include more run-of-the-mill innovations such as moving vendor payments from check to electronic, to the more advanced technologies such as blockchain and DLT as well as bots and AI. The impact of DLT is only significant over the medium to long-term. 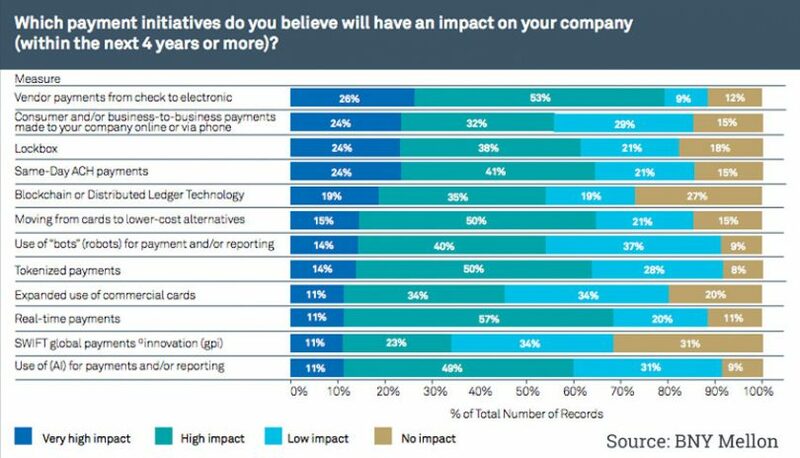 In the nearer term, the lower tech payment improvements are assessed as having the highest impact on business. These include moving to electronic payment, real-time payments, and tokenizing payments by using email or phone numbers as representations of bank accounts. The bank listed a raft of potential DLT benefits. These include operational simplification, regulatory efficiency by enabling real-time monitoring, and the reduction of counterparty risk. Plus there’s the improving settlement speeds, potential improvements liquidity and capital usage, and fraud minimization. The report states that in the near-term DLT applications will focus on capital market and security solutions. Perhaps a reference to the Utility Settlement Coin where BNY Mellon is part of the 17 bank group looking to use central bank deposits to back an institutional stable coin. That wasn’t mentioned in the report. Instead, it cited the Australian Securities Exchange as an example. Concerning readiness, only six percent of companies are ready to embark on DLT projects now, 9% within the next 12 months and the figure increased to 43% when the timeframe moved to three years. 23% stated it was more than five years away. In the sub-three-year time frame, AI and bots both score higher in importance than DLT at more than 50% each. It’s only when looking at five years and beyond that blockchain is cited at the most impactful initiative. This in part correlates with the areas where payment can be improved. While transparency is seen as desirable, regarding the most important features, it scored bottom of a list of eight factors. Cost was second from the bottom. The top four improvement areas were reliability, security, information-rich, and easy to execute. However, when looking longer term to the next ten years, reduced cost faired much better with 65% rating this as a significantly important factor, though not the most important. One of the significant issues affecting companies is the availability of IT resources needed to implement new technologies. 69% cited this as the most challenging issue, while 66% rated competing priorities as the biggest challenge.